The Lubbock Lights of History Channel's 'Project Blue Book' — how much can we trust those photos? – AiPT! 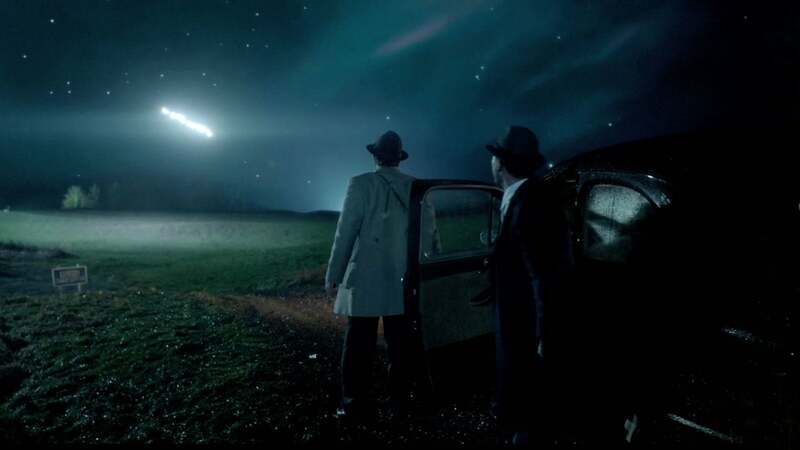 The Lubbock Lights of History Channel's 'Project Blue Book' -- how much can we trust those photos? To continue our look at each “real” UFO case highlighted by History Channel’s Project Blue Book TV series, we welcome back researcher Curt Collins to talk about the “Lubbock Lights,” a recurring phenomenon in the late summer of 1951, first observed by a group of professors from Lubbock’s Texas Technical College, and later (supposedly) photographed by a freshman student. There weren’t any radar reports, car stoppages or power outages, as depicted in this week’s episode, but there were photographs — photographs that may not be as good as first thought, if recent investigation is any indication. THE LUBBOCK LIGHTS, flying in formation, are considered by the Air Force the most unexplainable phenomena yet observed. These photographs were made at Lubbock, Texas on Aug. 30, 1951, by [college student] Carl Hart Jr. Scientists say lights were not natural objects, but they traveled too fast and too soundlessly for known machines. The article prompted the actual Lubbock eyewitnesses to write in to correct the record. The Hart photos did not match what they had reported seeing. Their letter appeared in the April 28, 1952 issue of Life. As observers of the Lubbock lights, we feel the record requires that we point out that the groups of objects shown in the Hart photographs are, in these respects, essentially different from any of the 12 or more groups that we sighted. 1) All but three of the groups we sighted had no geometric form; those three were smooth arcs, not V-shaped. 2) Those three could not be conclusively determined to be composed of individual lights, but certainly they were not made up of two distinct rows of alternately spaced lights. 3) None of our sightings was either bright enough, nor in view long enough (3 seconds) to offer any possibility of being photographed. 4) Even if the lights we saw had been particularly rich in nonvisible ultraviolet light, they could not have been photographed without special equipment. 5) All of our sightings were close to the same speed of 30 degrees per second, at which speed it would be impossible to follow them with a camera accurately enough to obtain an unblurred image. Air Force experts had considered these objections of Professor Ducker and Doctors Oberg, Robinson and George. But they are still convinced that Hart was able to get exposures of the two groups he saw (4 seconds for each to cross the sky, 1-1/2 minutes apart) and found no reason to repudiate his pictures. — ED. Ufologist James W. Moseley visited Lubbock in 1954, and interviewed people involved in the case — witness Professor W. L. Ducker, Carl Hart (who had taken the pictures) and William Hams, the Lubbock reporter that arranged for the purchase and publication of the photos. Moseley’s report described Ducker’s thoughts about the UFO, and the Air Force’s investigation. The Intelligence officers he talked to seem convinced that the photographs were not of the Lubbock Lights … For another thing, the lights Ducker saw were very faint, whereas Intelligence officers told him at the time that Hart’s photographs were of lights whose total brilliance would be several times that of the full moon… no one else in Lubbock, to the best of Ducker’s knowledge reported the lights on the night Hart took his pictures. In a 2012 discussion, “The Lubbock Lights case,” on the Above Top Secret website’s “Aliens and UFOs” forum, “Nablator,” (AKA Nab Lator of the Roswell Slides Research Group) posted a series of comments analyzing the Hart UFO photos. I think the perfect light pattern match in photos A and B is is only possible if the lights hovered, perfectly motionless, for a second or two or if Carl Hart hoaxed his famous photos. He could have done it very simply, punched holes in a cardboard with a pencil and taken pictures of it against the light, looking just as dark as the night sky. Only he should have changed the cardboard between photo A and B to make the series more believable. The “real” Lubbock Lights reported by the eyewitnesses were loose formations of dim lights. It was an illusion of sorts, not distant large objects flying at great speed, just flocks of migrating birds that reflected city lights as they passed over Lubbock at a much lower altitude. Once Ducker and the other witnesses reported it, other people in Lubbock were out looking and many others saw the UFOs, too. The famous photos produced by Carl Hart Jr. seem to be based on what a teenager thought the witnesses had described. Hart’s photos of the UFOs have never been conclusively authenticated, or proven to be a hoax. If somehow the photos were of a real UFO, unlike the “real” Lubbock Lights, Hart was the only one to see it. Edward J. Ruppelt, the analogue of whom is played by Michael Malarkey in Project Blue Book, did indeed conclude that the Lubbock Lights were caused by the mercury vapor street lights reflecting off flocks of plovers. One of the original witnesses eventually came to the same realization, and several other witnesses could even hear them. Strangely enough, though, Ruppelt would later change his mind and claim the lights were positively identified as something else, something he couldn’t reveal to protect the anonymity of the person who really solved the case.